AUTISM ACADEMY –Welcome to the Autism Academy, a school that provides an education for children with autism where we also utilize service dogs in assisting our students. 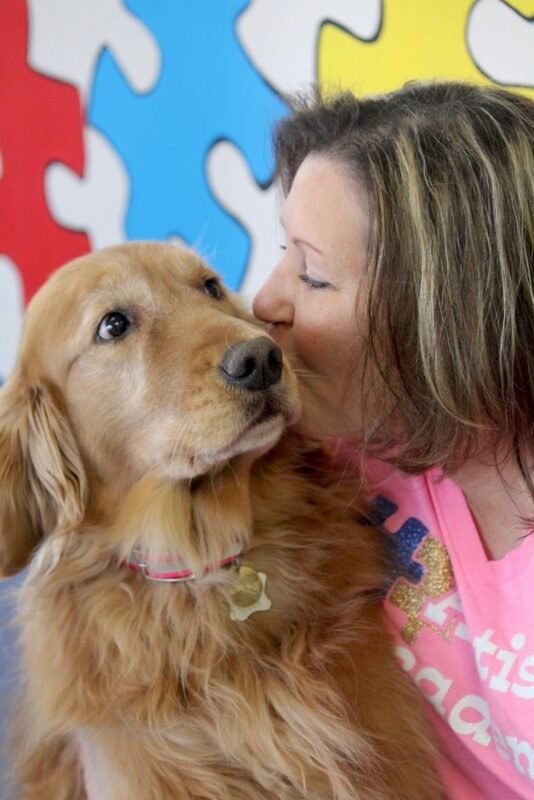 We individualize our school from other schools for children with autism because we strive to support our children with autism by incorporating service dogs and special teaching techniques. It’s common for kids to get pets for the holidays, but students at the Autism Academy have six dogs as classmates. Throughout the school year, each campus shares an extraordinary relationship with six witty and adorable dogs. Dogs help children with autism experiencing sleep conditions, the dangerous tendency of wandering, positive touch, and friendship. In fact, there’s a host of benefits to having a dog as a classmate and a friend. Children with disabilities can pose distinctive challenges for parents. Autism presents even more distinct challenges than other predominant disabilities. Children with autism do not connect well in various environments. Autism manifests itself most strikingly as impairments in communication and social relationships. Many children with autism are nonverbal, and those that are verbal, usually do not use their communication skills to engage with people in their environment. Some children even exhibit serious behavioral concerns, including, at times, self-injury. In addition, many of these children have a strong need for structured, routine environments, because change creates feelings of fear and anxiety. Children with autism are extremely systematic, orderly, and routine oriented. Disruptive events that occur as minor incidents can cause an extreme breakdown amongst students with autism. Dogs can help calm, console and distract them from such disappointments. Service dogs also attract kids that are eager to connect with an outside world that might not understand them. However, service dogs are expensive. An estimate for one trained dog is upward of $14,000, depending on the needs. After the purchase, it takes approximately nine months of training before the new dog is prepared to fully function in the classroom. Crabtree is a volunteer puppy raiser for Guide Dogs of the Desert – she’s been training dogs for more than a decade. In addition, she owns Fur-Ever Chins, with the help of her husband, Jason. Their residence is home to nine dogs and more than 60 chinchillas. “I’ve always loved animals,” Crabtree said. “With no plans of having babies of my own, at age 35, I got pregnant,” she explained. After giving birth to her daughter, Meikayla, she also acquired a special passion for children. On every campus, she takes six service dogs into various classrooms. Mozzie is a four year old collie; Kodabear is a six year old newfoundland/ leonberger; Sunset is a seven year old golden retriever; Willow is an eleven month old maltipoo; Patriot is a six month old newfoundland; and Rebel is a six month old great pyrenees/anatolian shepherd. “These service dogs are trained to work specifically with the kids at the school,” Crabtree said. They aid non-verbal students by responding to hand commands. They support speech therapy by responding to verbal commands. They assist with field trips by preventing students from straying off. They help kids remember hygiene techniques. Teachers also use ‘Dog Time’ as a way to reward students with more personal interaction, dog races, and fetch time. Students transition from fear to calmness as they gain more familiarity with the dogs in a learning environment. National Dog Day has two goals, to honor dogs, and rescue them from homelessness and abuse. Start early by making plans and personal videos throughout the year to post online in an effort to celebrate National Dog Day, Saturday, August 26, 2017. The National Dog Day Foundation hopes to rescue 10,000 dogs a year. To see more pictures of our service dogs, check out our gallery. If you’re interested in sending your child with autism to a school that provides a fantastic education and goes above and beyond to ensure your child is supported, then call (480) 347-9492.